As regular readers might know, I’m on a quest to try out all of the fountain pen friendly notebooks that I can get my hands on. 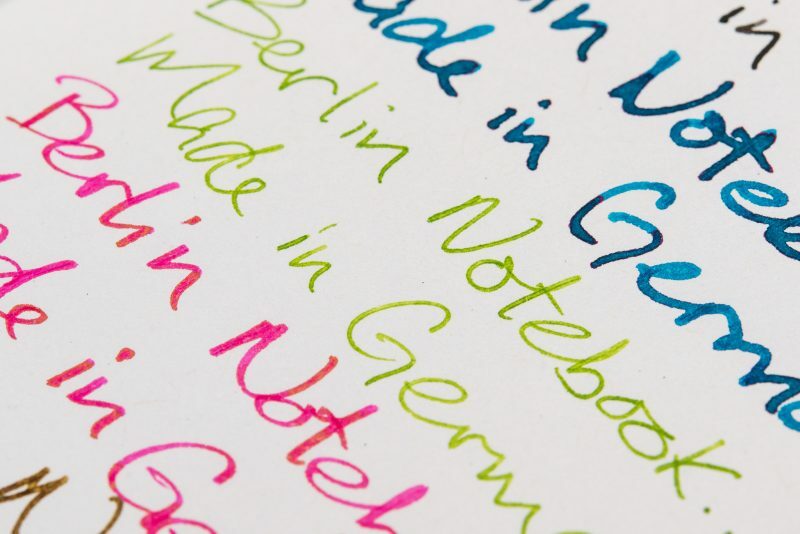 Recently I was contacted by Berlin Notebook to see if I wanted to give their notebooks a try. Of course, I jumped at the opportunity since (as far as I know) they are only available for purchase online unless you live in Berlin. When I first received my Berlin Notebook two-pack, I immediately noticed the clean, simple look that they have. The cover is made of a heavy brown paper and the company name, printed in a bold black font, is the only adornment to the front cover. The cover opens flat and stays open during writing sessions. On first touch, the paper feels a little rough, so I was curious to see how writing on it would feel. The notebooks are slightly larger than A6 sized, which makes them perfect for a pocket or a bag. This is the only thing you’ll find on the front cover of this notebook. 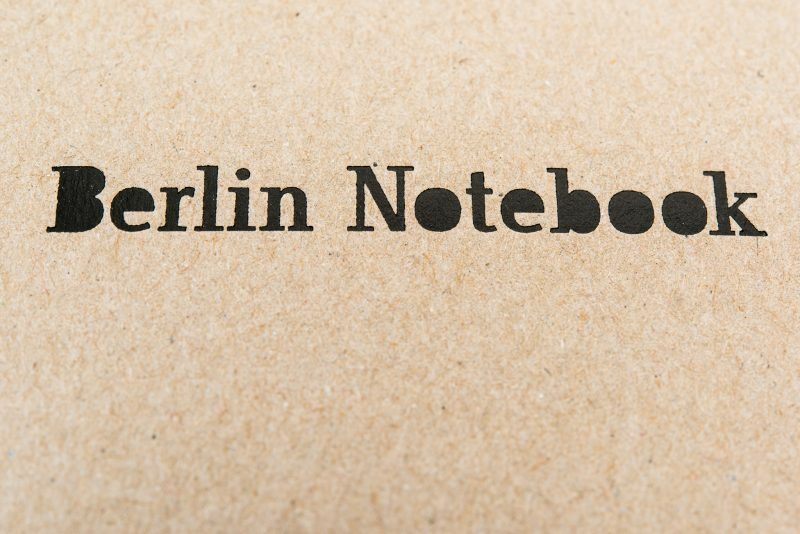 Berlin Notebooks are simple notebooks. They don’t have any type of extra features such as page numbers, an index, or an elastic closure. A new model was just introduced that features a holographic logo instead of the black logo, but that seems to be about the only additional option you can get for these notebooks. 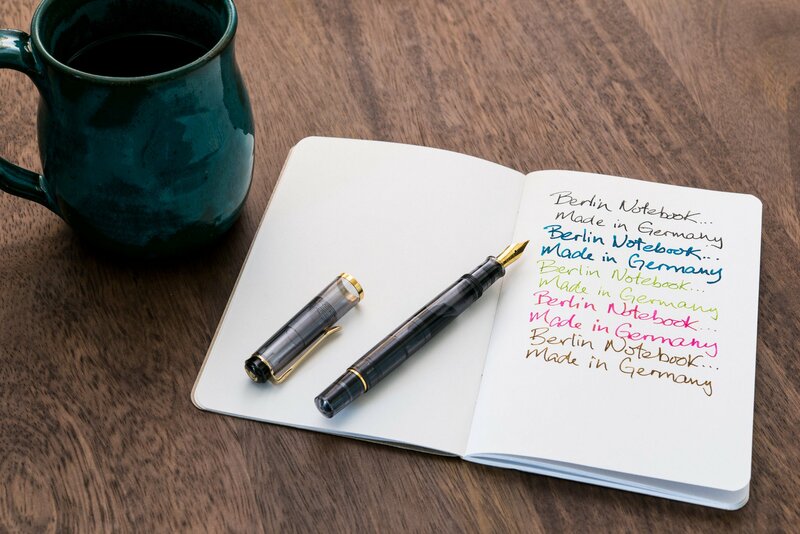 They feature 100% recycled paper in both the pages and cover, which is not something that you will typically find in a fountain pen friendly notebook. The paper is nice and heavy, weighing in at 100gsm. 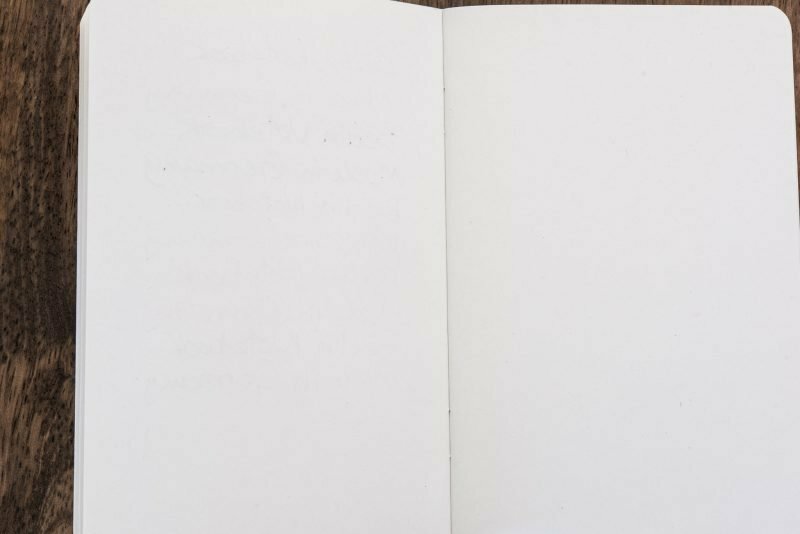 The last 4 pages of each notebook are perforated, so if you need to write a note or directions and tear it out for someone, you don’t have to worry about destroying your notebook in the process. The binding consists of two staples, which is perfect for these 48-page notebooks. The Berlin Notebook is the perfect size for a travel notebook. 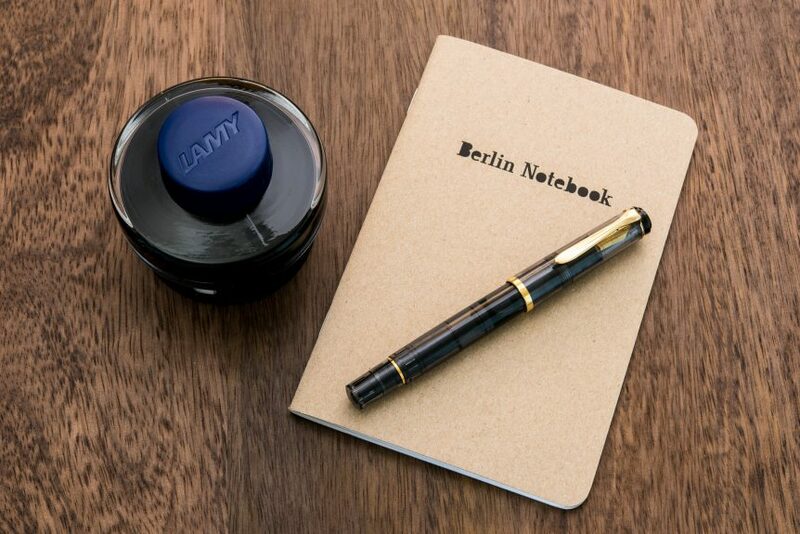 When I started writing in the Berlin Notebook, I must say that I was impressed! While the feel of the paper isn’t exactly rough to write on, it isn’t the smoothest paper I’ve ever used. Still, it is pleasant to write on as long as you don’t mind a little feedback (which I don’t). As for overall performance, this is some great paper! The first thing I noticed is that there is practically no ghosting. I really had to look to see any of the writing on the other side of a full page of writing, even with multiple inks and nib sizes. This is great news if you like to write or draw on both sides of a page. I did get some bleeding with very wet nibs, but most pens will be just fine with this paper. I didn’t see any feathering in my writing, but the edges of my letters weren’t as crisp as I’m used to with an ultra-smooth Japanese paper such as Tomoe River. Shading and sheen were not as dramatic as you would get from some other papers. While they were still present for most of the inks I used, they were by no means extreme. Here you can see that there is very little ghosting. The second pen from the top did bleed a little bit. 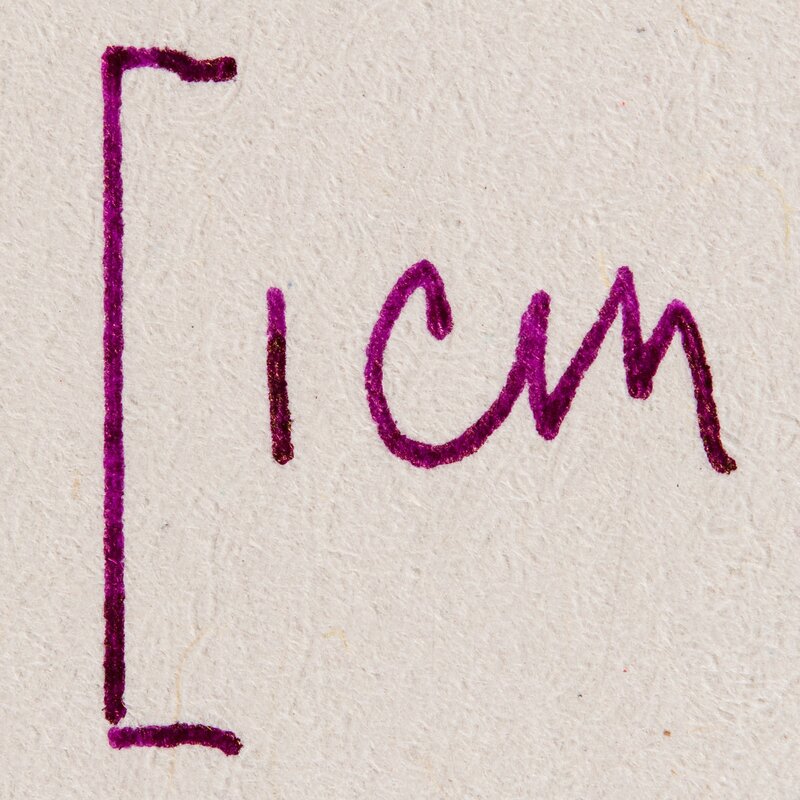 This writing detail shows the shading and sheen. I did find that with some of my doodles the paper was more likely to bleed, but this was because I would fill in spaces with ink. 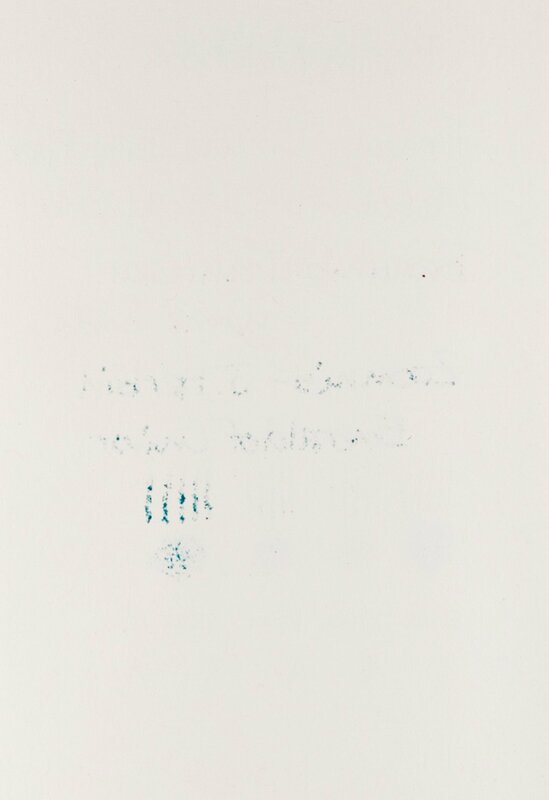 The inks that bled when I colored with them did not bleed when I wrote with them, so I know the bleeding was due to how much ink was being applied to a particular area. If you enjoy drawing or doodling in a way that involves coloring with fountain pens, these notebooks probably aren’t the best option for you. For many people, the words “recycled” and “fountain pen friendly” aren’t usually used together when describing paper. 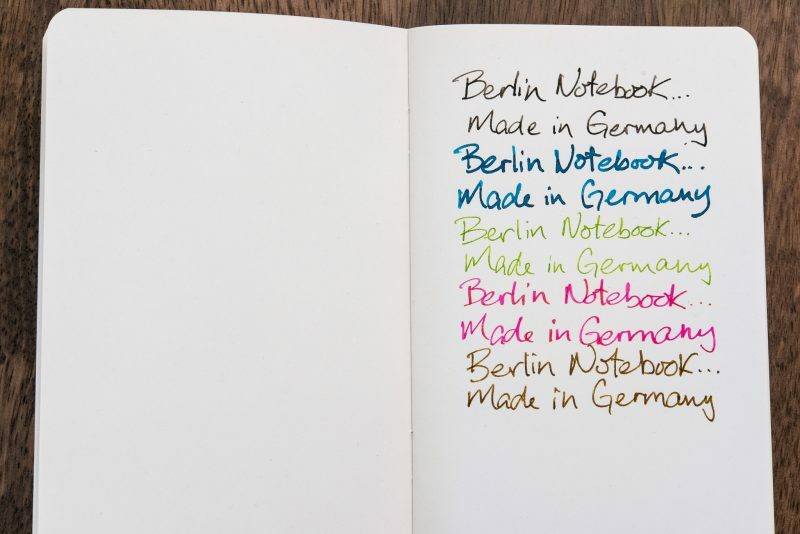 Fortunately, Berlin Notebooks have paper that is both 100% recycled and is also fountain pen friendly. In fact, in some aspects it is more fountain pen friendly than many of the more popular papers on the market today. 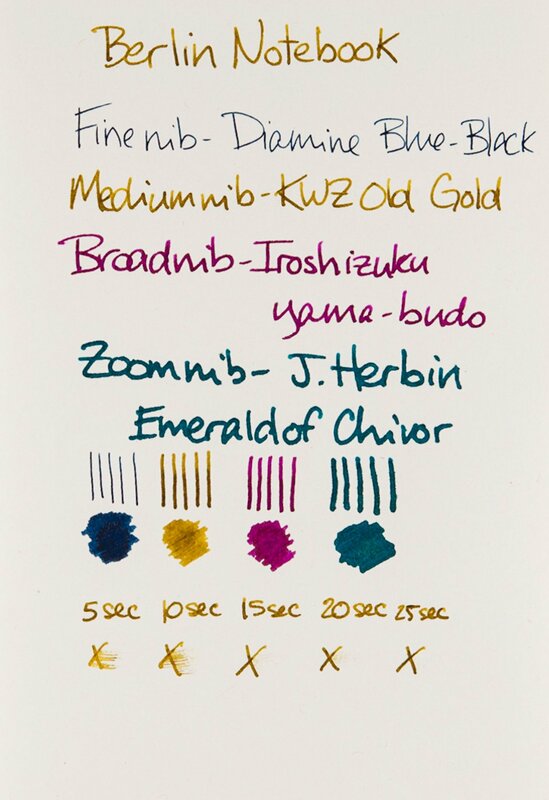 While it may not show extreme amounts of sheen or shading, it handles ink very well and has very little feathering, bleeding and ghosting. This is one of the only notebooks that I have in which I would even consider writing on both sides of a page. While the paper quality is great, it takes more than good paper to make a good notebook. The Berlin Notebook is well made and its simple staple binding should stand up to regular use. It is a convenient size that makes it easy to take with you anywhere. Its clean and simple design should appeal to most people, whether you intend to keep it as it is or adorn it with drawings, stickers or washi tape. 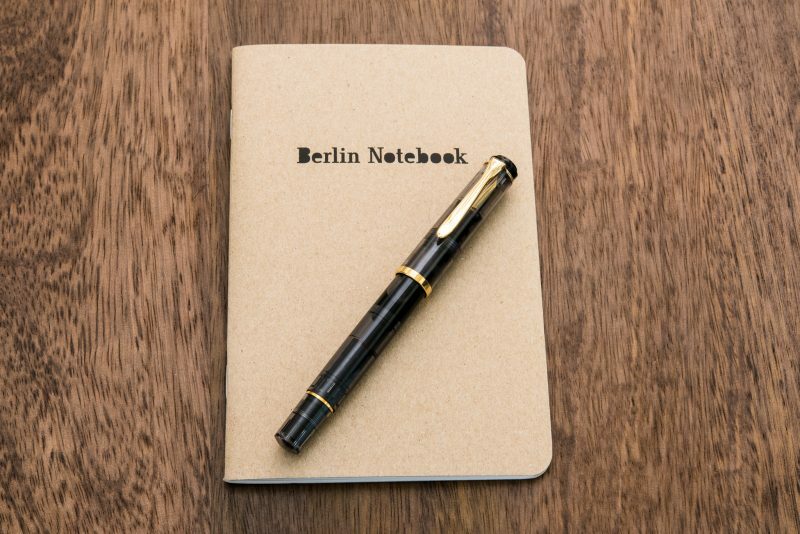 If you enjoy taking a small, simple notebook with you on your outings, whether it is for writing or drawing, I would recommend a Berlin Notebook. Don’t expect the most luxurious experience you’ve ever had putting pen to paper, but do expect a quality product that performs well. Take it anywhere. The Berlin Notebook travels well. 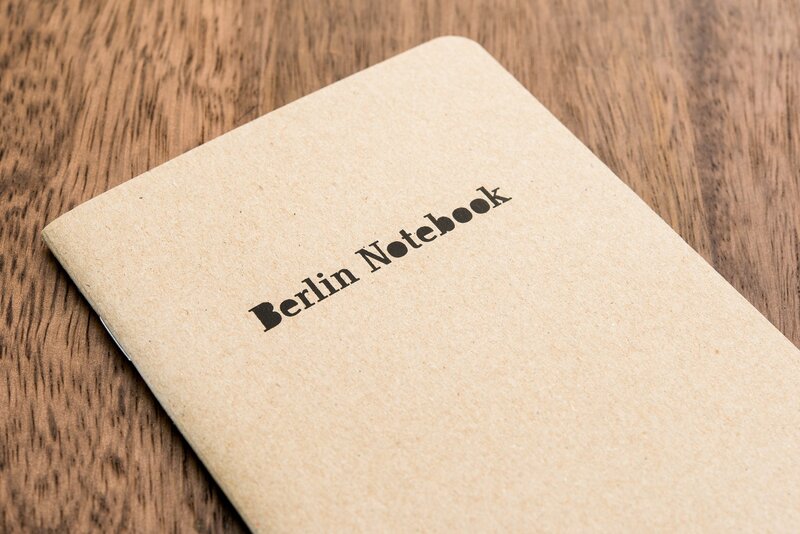 A single Berlin Notebook has a retail price of €4.95 or you can get a 3-pack for €12.95. It looks like shipping is a flat rate of €1.50, at least in the United States. Disclaimer: These notebooks were provided to me for free for the purposes of this review. All opinions in this review are my own and were not influenced by the generosity of Berlin Notebook. I can appreciate your review John, but doesn’t the price strike you as being expensive? If I bought this notebook, I would be afraid to use it and would continue using backs of envelopes. Have you noticed how letters you receive from banks and advertisers always have a superior paper for the envelope compared to the letter? 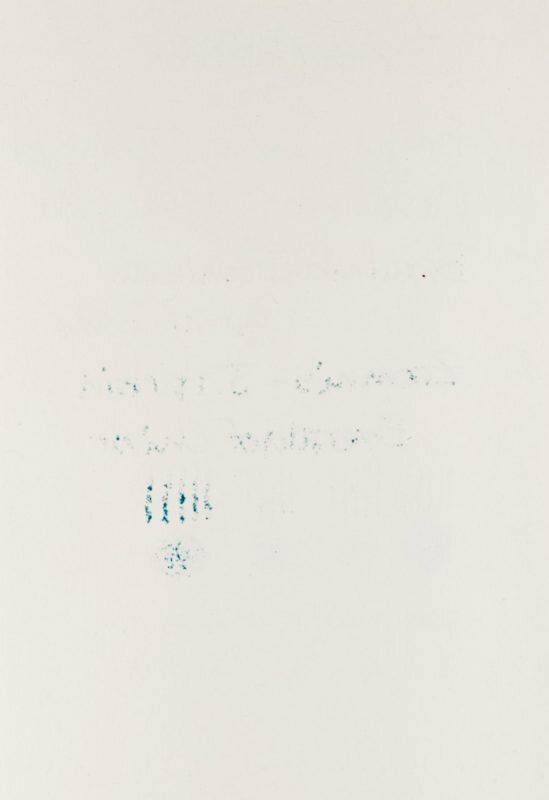 Using a fountain pen, the ink bleeds on the back of the letter but never on the back of the envelope (if it’s white paper). What interests me is finding a brand of loose A4 ream (500 sheets, for those that didn’t know) that can be used every day with no bleeding. Cheap copy paper is very good value if you use a ballpoint, but how much more would I need to spend for fountain pen-friendly paper? Thanks for your comment, Noel. Honestly, the price for this is fairly standard for most typical fountain pen friendly notebooks. I would say the target market is people who care about using 100% recycled paper and want a nice notebook to use for personal notes or while traveling, in which case having everything contained in one notebook instead of on random pieces of paper would be important. If you’re looking for a ream of paper that is fountain pen friendly, the HP 32lb Laser paper is wonderful. It is Letter sized, so slightly shorter than A4. It costs more than really cheap paper, but the cost per sheet is still minimal compared to premium notebooks.